I also love it styled with winter white jeans and a pop of pink! And, I found some pink mules on sale for 70% off (for only $30)! You may have noticed lately that I am trying to promote staple items that can be worn multiple ways by showing more than one way to style the item. Last week, I shared 10 different ways to style cognac boots, and the week before, I shared five different ways to style black jeans. And, if you love being comfy - I shared three different ways to wear sneakers. I have definitely gotten more picky about what I buy. If it is not something I can wear different ways - I usually decide not to buy it. Also, if you like this leopard look - I also shared last week how to style a grey leopard jacket with cognac boots. And, the jacket could easily be swapped out for this grey leopard sweatshirt for under $20 - that looks great with the look, too! This relaxed cashmere v-neck sweater for 33% off. This velvet blazer in black and burgundy for 50% off. These skinny jeans are 45% off. This plaid parka is 60% off. This snake print pleated skirt. These gold mules are under $50. This winter white tweed jacket. This powder pink blazer for $35 (and also in more colors). This $25 dress is back - and you can see how I styled it last year HERE. This fleece jacket for 40% off - comes in off white, brown, and black. This faux shearling jacket for $65. This striped utility blouse is 40% off. This camo parka with a faux fur trimmed hood is 60% off. This striped blazer is $60. This faux leather cropped blazer for great price. 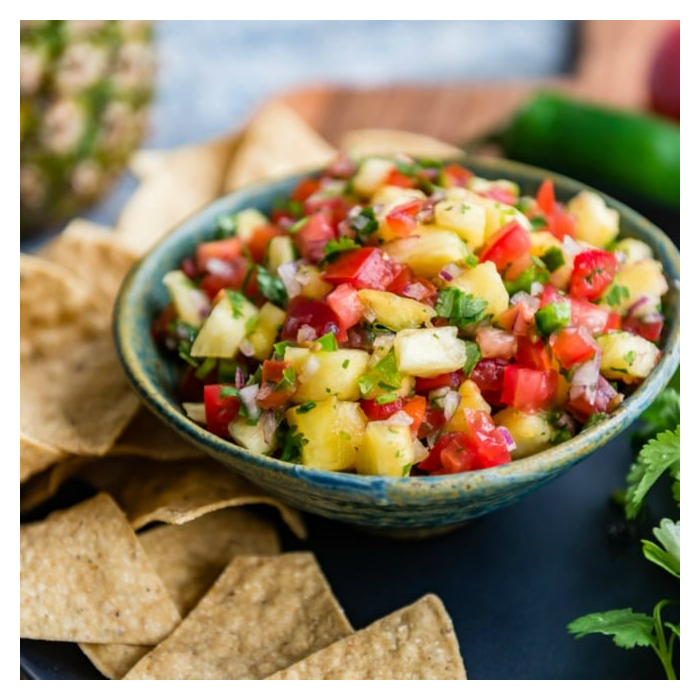 As promised, here is my recipe for pineapple salsa. I made this on Sunday for the Super Bowl - and it was so good! The flavors need time to blend - so I recommend making it a few hours early. I mix this all in a bowl - and adjust ingredients as needed, depending on taste. My measurements are for reference. If you are headed somewhere warm this winter - be sure to check out my mix and match outfit guide HERE. That pineapple salsa looks so refreshing! 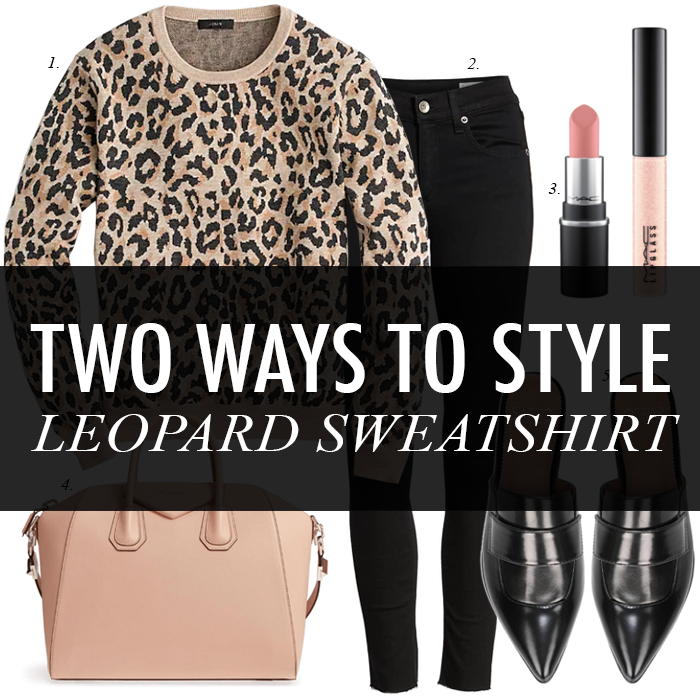 Love these leopard sweatshirt outfit ideas to pieces! You’re so good girl, have a terrific Tuesday! That's so cool that your mom inspired this look! I'm with you on trying to be more picky in my purchases. I keep reminding myself "buy less, buy better." I love both ways! And love the comfy faxtor of a sweatshirt but a cute leopard one at that! The neutrals with the hot pink shoes is darling too! Such fabulous looks- I love leopard and how bold it is with those hot pink mules!